I decided to go for 13 miles this morning; it’s been quite a while since I’d run a half-marathon (last September, perhaps?) and the weather outside was perfect: mid-70s and overcast. Kath would be so proud! It was 1/4 C oats, thinned with my new find So Delicious Coconut Milk, 1/2 banana, 1/2 C sliced strawberries, 4 oz. 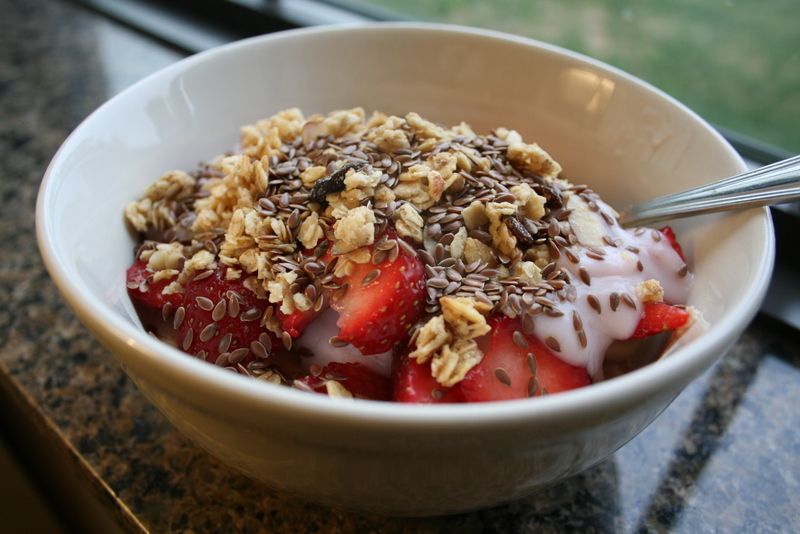 strawberry yogurt, 2 tbsp Wegmans granola and some flax seeds. It was awesome! 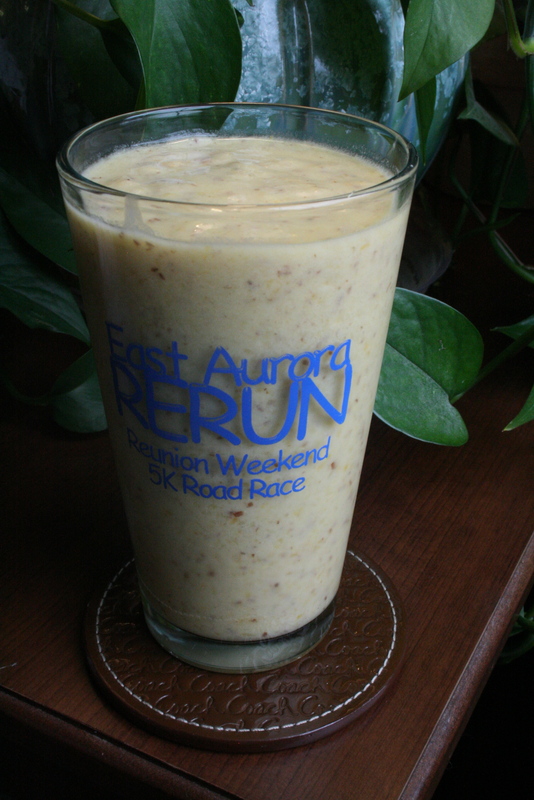 I was a bit worried it would be a little heavy in my tummy for my run, but I had to fuel up somehow. I devised a plan that would allow me to not carry anything on my run. I hate holding stuff, like a water bottle, while running. I would do 4-5 miles outside, then 3-4 miles inside on the treadmill while eating and drinking, then finish up the remaining miles outside again. I set my towel, water bottle and snack out by the door and headed outside. I did my 5-mile residential route near the hotel in 40:30 and quickly let myself back into the hotel. Susy found these awhile back and we ended up splitting a box of them that she ordered online. I only have two left! Instead of a goo or a gel, these are nickel-sized gummies you can chew while running. I’m not sure which I prefer (sport beans, goo or chews), but these certainly take a little while to eat. Goos are often thick and a little chalky, so I have to have water immediately after, but the upside of goo is that it’s super quick to take. I’ll have to do some recon around here to see where I can find an assortment of refueling options and pick up a couple soon. I used to think I didn’t need a gel or anything unless I was running a full marathon, but in reality, anytime I run ten or more miles, I make sure to take something around mile 4 or 5 to help keep me going. Anyway… I hopped on the treadmill and set it for 7.7. I’m not sure what that equates to (this machine didn’t tell me what my pace per mile was), but I ended up doing 5 miles in 39 minutes–FAST! Thankfully, I got to talking to the guy next to me, who just relocated temporarily from Florida, so that helped kill the time. I quickly dropped my towel and water bottle back off in the room and headed out for the remaining 3 miles. My legs were tired after such a fast pace on the treadmill, but I smiled to myself as I left the parking lot for the second time this morning, because I felt so good and strong and healthy. Despite my fatigue (ten-plus miles will do that to you no matter how well you refuel), I was definitely on a runner’s high. I slowed a bit to about a 9-minute mile for my remaining three, but still felt good. It’s not often I run 13 miles. On a whim. By myself. I was craving something chocolate-y and decadent after that run and knew I needed to start eating soon. 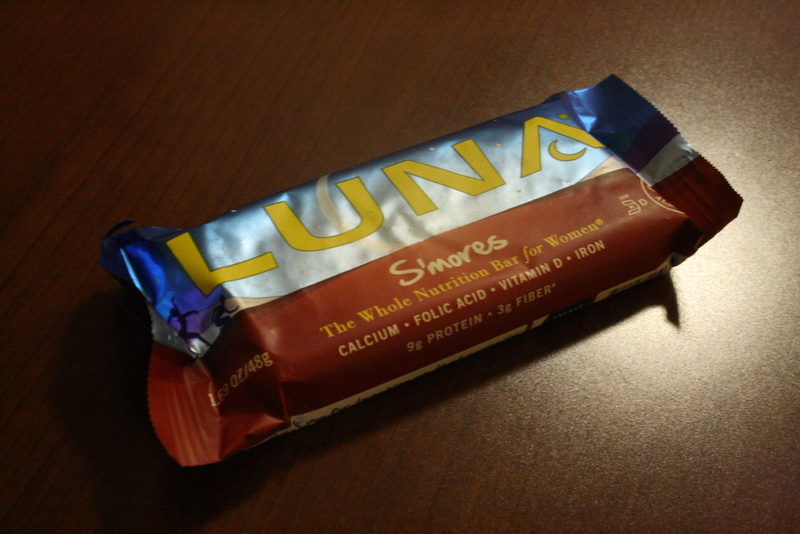 I LOVE Luna bars. 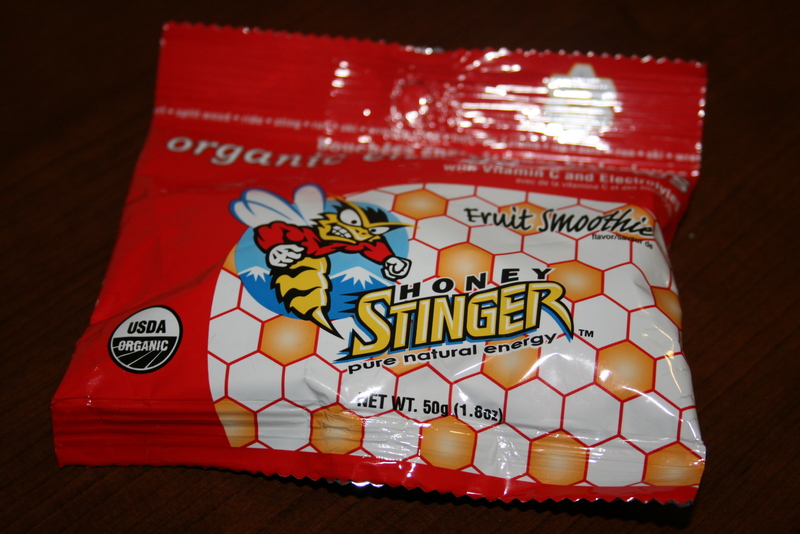 They taste great, and with only about 180 calories each, they are great snacks without being too much. I figured out my time for this morning, and it is my fastest yet! My last actual half-marathons have all been almost exactly 2 hours, to the minute. My first one at that time was great, but later on I’d been training faster yet always crashed mid-race. Needless to say, my last couple half-marathons have been very disappointing. My time today: 1:46! As in ONE HOUR AND FORTY-SIX MINUTES! Holy cow! How did that happen? Well, losing 18 pounds doesn’t hurt, and I think I’ve come up with the reason I was always crashing. I always went out fast with Susy, and I just couldn’t maintain her speed. I’ve gotten faster, but I have to keep my pace strong and even to have energy left to finish the distance. For me, that’s about 8-minute miles, max. I used the remaining half of my banana, 1/2 cups each of pineapple and frozen peaches and mango chunks, 1/4 C plain yogurt, 1/2 C coconut milk and flaxseed meal. YUM. Andrew got a strawberry-banana one with oats and flaxseed meal. Posted on August 6, 2011 February 27, 2016 by thehealthypineapplePosted in #fabfood, Breakfast & Breads, i ♥ runningTagged coconut milk, East Aurora, Exercise, Food, Granola, half-marathon, honey stingers, luna bars, Oats, pineapples, Running, smoothies. Next Next post: THREE homeruns in one day – score!